"A tasty chicken and pasta dish." In a large pot of salted boiling water, cook angel hair pasta until it is al dente, about 8 to 10 minutes. Drain, and set aside. In a large skillet, heat oil over medium-high heat. Saute the onions and garlic. Stir in the tomatoes, chicken, basil, salt and hot pepper sauce. Reduce heat to medium, and cover skillet. Simmer for about 5 minutes, stirring frequently, until mixture is hot and tomatoes are soft. Toss sauce with hot cooked angel hair pasta to coat. Serve with Parmesan cheese. 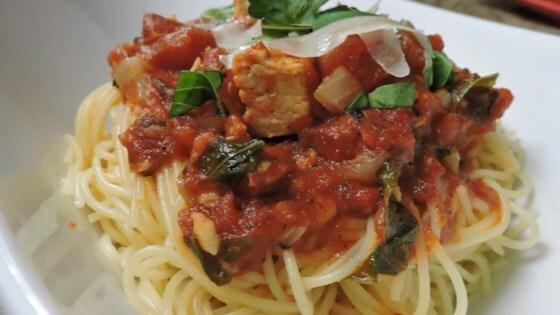 Chicken breasts are simmered in a spicy tomato and basil sauce. Like others, I did not have all fresh tomatoes on hand so I had to subsitute some canned diced tomatoes and I think that might be the way I'd make it again. I also added a little sugar to taste.